O.M.G! Is it 2007 already? Huge wishes for the New Year. Hubby and I decided to start this New Year with a clear head and fresh air. So we took off to the countryside in our ageing mean machine. Our two bedroom cottage was on a farm near an aptly-named village called Nomansland. We had no mobile phone coverage and no cash machine within easy walking distance. I even had to wear wellies because my two-inch heels sunk right into the slushy countryside. Quelle Horreur!! 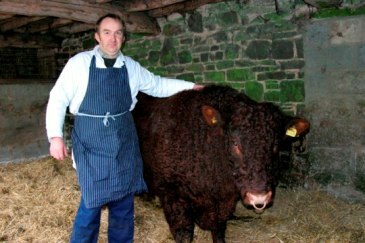 We managed to find a lovely local farmer called Robert James (pictured with his prize-winning bull) and buy fresh sirloin steaks for dinner. As I started cooking them on New Year’s Eve, I gave hubby the simple task of lighting the coal fire in the living room. Before I could say medium-to-well-done, the open plan living area was filled with great big clouds of black smoke. The fire alarm promptly went off and hubby had to go running to fetch the farm owner from the crucial moment in his murder mystery party. I stood there waiting, whacking the fire alarm off with a designer shoe to stop it from upsetting the cattle, hens, sheep, countryside in general and the other guests on the farm. A very happy new year to you……! The getaway must have been nice, despite the little quirk. Sending many best wishes your way!